Imation announced that it is closing its Weatherford, Okla., tape coating plant. The Weatherford plant was the last coating plant in the United States, and its closing ends Imation's history as a leader in producing tape, floppy disks and other magnetic media. As a 3M spin-off, Imation carried the legacy of 3M's legendary Black Watch 9-track tape, the QIC cartridge and other significant breakthroughs. Focus is shifting to flash, Imation RDX - Removable Disk Storage, external hard drives, whilst still producing magnetic tape cartridges under the Imation, Memorex and TDK brand (under license from TDK Japan). All future tape in Imation cartridges will be made at TDK's plant in Japan. Checkout our line-up of Imation RDX cartridges and bundle packages now available and in stock at BackupWorks. 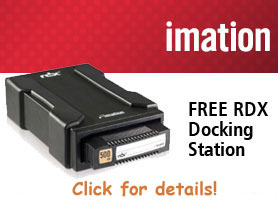 Also checkout the FREE RDX docking station promotion good while stocks last.